Vinyl album: AMLH 64535 (A&M, UK, 1975). 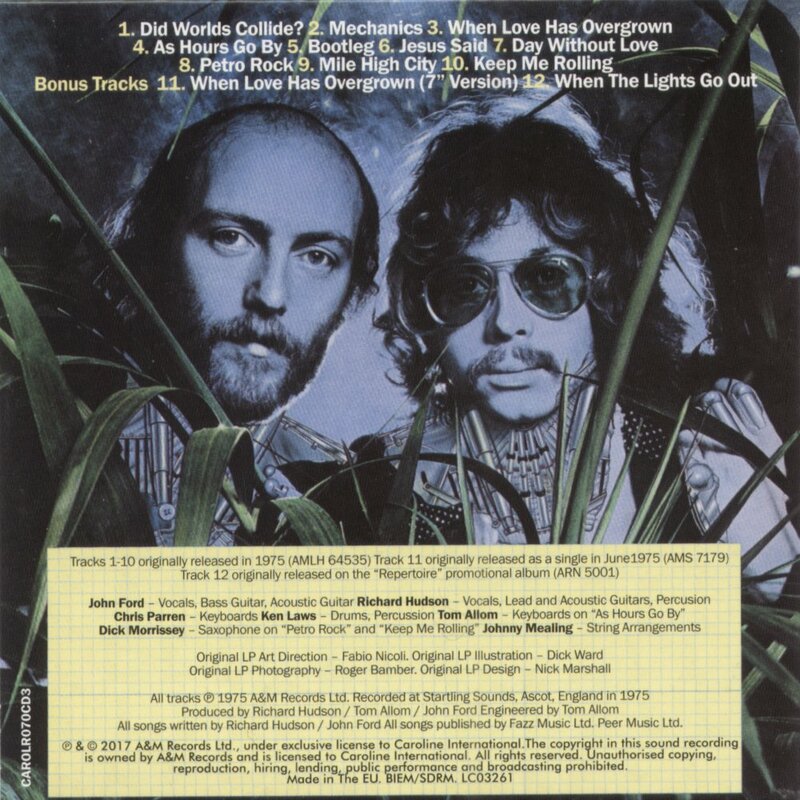 Clever cover showing Hud and John in overgrown jungle, and the same image on the back reveals them to be robotic - perhaps the "Mechanics" referred to in track 2. There's an inner sleeve, lyrics on one side, blank on the other. Silver labels. Vinyl album: SP 4535 (A&M, US, 1974).White promo labels. The copy I have doesn't have a promo sticker, but the copy listed on Discogs does. Sleeve identical to UK, except for different colouring on the front cover (Hudson-Ford in white rather than red); on the back at bottom right of the yellow box, instead of the A&M logo and catalogue number, there is the US address. Unusually, no US catalogue number other than on the record sleeve spine. Vinyl album: SP 4535 (A&M, US, 1974). Single sleeve, same as promo above. Comes with black and white lyric inner sleeve, lyrics on one side, blank on the other. Silver labels. 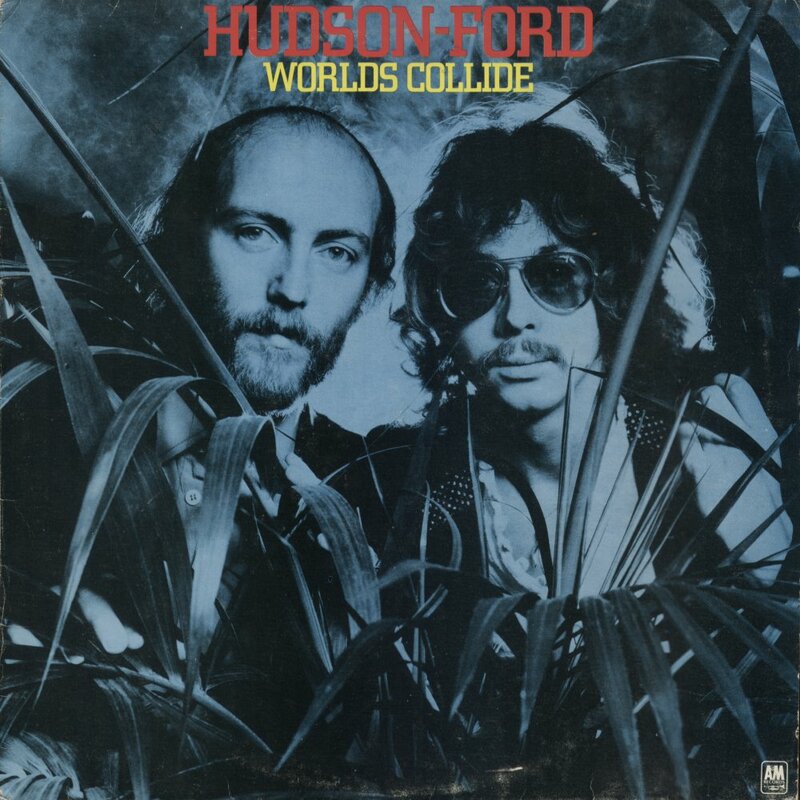 Vinyl album: SP 4535 (A&M, Canada, 1975).Pretty much identical to US release (yellow and white front lettering) , with the Milner Avenue address details at bottom right of back cover. White labels, matching typography of silver label, but with old style red A&M logo. My copy came in a nice brown sleeve with a poly protective inner, french text on one side, english on the other. Lyrics insert included. Vinyl album: SP 4535 (A&M, Canada, 1975). Listed on Discogs. 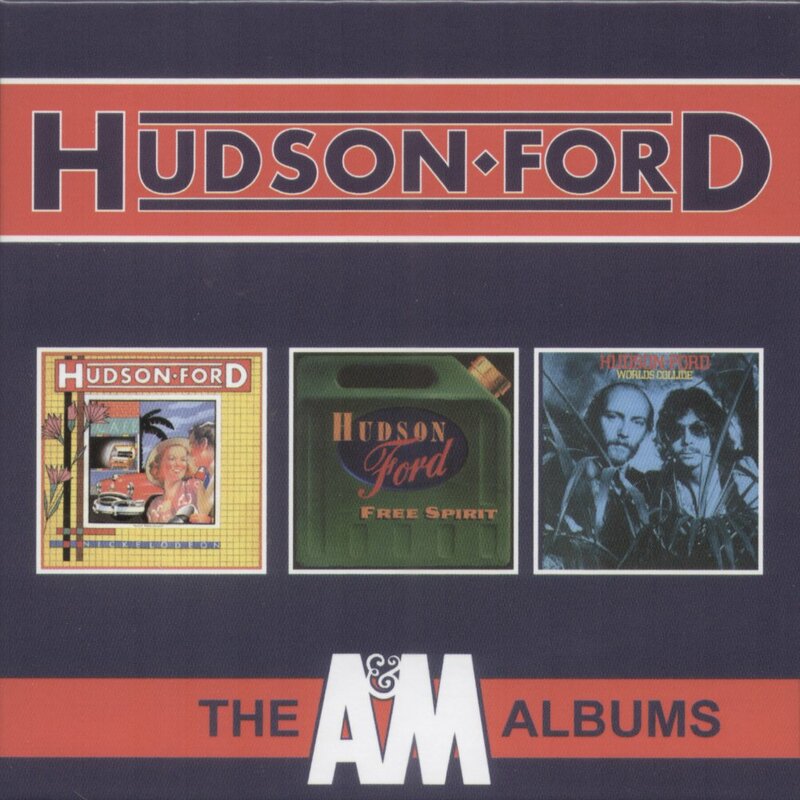 Cover very similar to UK, but "Hudson Ford" in white not red type. Silver labels, and, it would seem from Discogs, a nice gold A&M Canada protective innersleeve as well as a one-sided lyrics insert. The copy I received didn't have the standard A&M sleeve pictured on Discogs (which I have already), but instead a much earlier one featuring mainly Herb Alpert albums on the front and other 60s releases - all very bossa nova - on the back (which I didn't have). Vinyl album: SA&M 2152 (A&M/Disco E cultura, Brazil, 1975?). Cover modelled on US cover (has US A&M address and white/yellow lettering on artist and title). Brazilian catalogue number top right back cover, other Brazilian release wording bottom left. Silver labels, with Portuguese wording but titles remain in English. The one-sided insert is same as US but has Brazilian catalogue number top right. 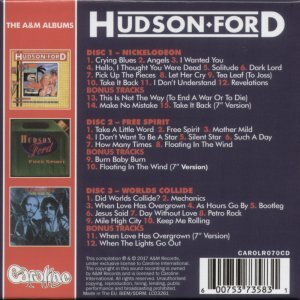 Cassette: (A&M, UK, 1975). Likely there was one - anyone have it? 8-track: (A&M, UK, 1975). May have been one - anyone have it? 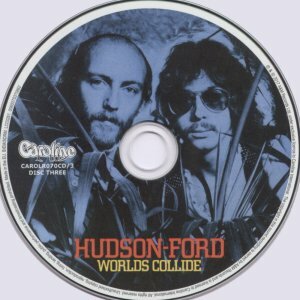 Worlds Collide is now available on CD as a legitimate release as part of Hudson Ford - The A&M Years boxed set, released May 2017, wth bonus tracks and excellent packaging..
CD bootleg: RDI 33053 (RDI, Spain, 2009).. Bootleg release, no bonus tracks. All four Hudson Ford releases came out as unauthorised bootleg CDs, produced in Spain by Retrodisk International. Packaging designed to match closely the original releases, insert is minimal, the outer modelled on front and back covers of original UK LP releases, with a standard biography in the centre. The CDs themselves are ugly and metallic. CD: Big Pink 421 (Big Pink, Korea, 2016).. All three A&M albums were released on CD by Big Pink in Korea. The packaging is identical to the Japanese Big Pink release below, apart from the Obi, which matches the front cover with a sort of transparet effect, and there is no sleeve notes insert. It is not clear whether this release is authorised. CD: VSCD 5672/Big Pink 421 (Vivid/Big Pink, Japan, 2016)..
Facsimile release from Korea. Outer sleeve matches UK release, comes with plain black Obi (unlike the Korean Big Pink CDs which feature a fake transparency on the front). Inside, the very plainly designed CD has a paper inner sleeve like an old fashioned 33 rpm LP (nice touch: it quotes playing speed as 200-500 rpm). Also included is a 2-sided lyric sheet and a 1-sided set of Japanese sleeve notes.